Episcopal completed the first phase of its campus master plan expansion project with the dedication ceremonies for the School’s two newest academic buildings, Parks and Lastinger Halls, on January 6, 2011. Named for one of the school’s founders, the late Reverend Robert Parks, and longtime Episcopal supporters, the Delores and Allen Lastinger family, the two new buildings encompass nearly 13,000 square feet of classroom space separated by an 8,000-square-foot courtyard. Each building houses 12, 900-square-foot classrooms, with the most updated technology available. The spaces encourage increased collaboration between students, interdisciplinary studies and allow today’s student to learn in a facility that fosters academic creativity. The buildings incorporate columns and Jeffersonian arches, outdoor hallways and second story open decks with views of the St Johns River and downtown Jacksonville. The Jacob F. Bryan III Library opened in the fall of the 1991-1992 school year. Professional staff provide students with support for research projects and other assistance. The library underwent extensive renovations in 2016 as part of the school’s Lead the Way Capital Campaign. a state of the art learning center with three computer labs, a makerspace, extensive archives and rare book collections, a student/alumni art gallery, and spaces for students to collaborate on assignments or quietly study. The Episcopal community dedicated the Dale D. Regan Plaza as a lasting tribute to Dale Regan on March 6, 2013. The Regan Plaza provides a safe place for quiet reflection or study and event space for special receptions. Named for one of the founding members of the School, David W. “Dink” Foerster, this building is one of the school’s original structures and houses classrooms. Called the “G” building for “General studies,” this building was one of the first on Episcopal’s campus. Today the building continues to house classrooms, and is mostly used for humanities studies. The World Languages (WL) building holds classroom space for Episcopal’s languages classrooms. Episcopal offers Latin, French, Spanish and Chinese. Episcopal has multiple computer labs available to students and faculty. Students use the computer labs for classes, on their own time for research and school projects. Faculty and staff can use the computer labs for professional development and training. Episcopal recently added an additional computer lab within the Bryan library, ensuring plenty of computer availability for the campus community. The Munnerlyn Center for Worship and Fine Arts opened in 2004, providing a multi-purpose space that includes the Munnerlyn stage, dance studios, music rooms, the Berg Gallery for rotating studio art displays, the Davis Chapel, and offices for fine arts faculty and staff. The Munnerlyn stage area provides a beautiful and professional setting for music, dance and theatre performances, including an 684 seat theatre. A smaller fine arts performance venue, the “off-off Broadway” Sikes Theatre is located in the heart of campus. Named for Florence M. Sikes, a drama and theatre instructor for many years at Episcopal, the space allows for a more intimate setting for performances. The School is very grateful to Ms. Sikes for making such a significant planned gift to Episcopal that renovations of the theatre were possible. Students enjoy classes in the theatre, and the entire community benefits from the performances staged there. The visual arts studio and ceramics studio are located near the Acosta House and the sixth grade center. The studios provide plenty of space for creativity, large scale projects, and storage for students’ work. The Episcopal campus contains a significant historic building, the Acosta House, built in the late 1800s or early 1900s. Purchased by St. Elmo W. Acosta in 1911, a Jacksonville businessman and City Council member. It then became part of the ESJ campus after the founding of the School. The Acosta House currently houses photography classes and studios. It’s wide porch is used for numerous School events, including Commencement ceremonies. 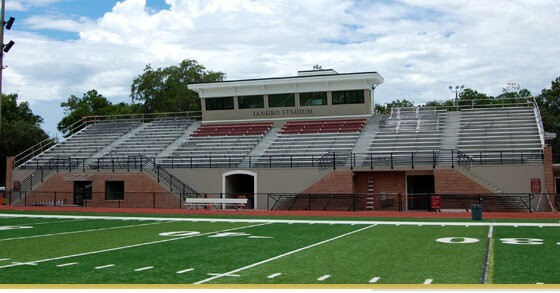 The McCormick Sports Complex includes Jangro Stadium and Pajcic-Hunt Field, both dedication in 2017 as part of the Lead the Way Capital Campaign, a FieldTurf playing field where football, soccer and lacrosse play, as well as Langford Track. Boasting full-service concessions, restroom facilities, a press box, picnic area and full stands, Jangro Stadium is a perfect place for families to enjoy a high-energy game! Pajcic-Hunt Field hosts more than 140 competitions each year and features FieldTurf, the industry leader of artificial turf. FieldTurf, known for its peak performance, athlete safety and longevity, allows Pajcic-Hunt Field to be used year-round with minimal upkeep requirements. The Field, installed during the summer of 2015, was dedicated on October 23, 2015 and named for the late Gary Pajcic, a longtime school champion, and longtime Episcopal coach Charles Hunt. Click here to read more about Gary Pajcic and Charles Hunt. Episcopal hosts local meets on its 400-meter long Langford Track, which has been refinished with a high-quality rubberized surface. With six lanes encircling Pajcic-Hunt Field, this campus feature offers runners a track that rivals many small college facilities. The Elizabeth Simpson Walton ‘71 Aquatic Center was dedicated in 2017 as part of the Lead the Way Capital Campaign. It features a pool with boys and girls locker and changing rooms, an elevated spectator observation deck, coaches’ offices, restrooms and pool deck showers. The complex also includes a new pump house and pool system, allowing the pool to be heated and cooled, providing a single-temperature pool all year round for ESJ and AmberJax swimmers. Randy Reese Pool was dedicated in 2017 as part of the Lead the Way Capital Campaign. Designed as a replica of the water polo pool used in the 1996 Atlanta Olympics, the Aquatic Center is one of Episcopal’s premier athletic facilities. As one of only two 50-meter high school pools in Northeast Florida, the Aquatic Center is the only one that has met the minimum depth requirement to permit starting blocks to be used for races. The 10 lanes are kept warm in the colder months with solar covers. Set on the scenic waterfront Knight Sports Campus, Episcopal’s Walton Boathouse gives direct river access to the rowing teams. The ample bays are capable of holding the rowers’ many shells and the building is complete with erg machines, work-out facilities, meeting and locker rooms and a lounge overlooking the water. Dedicated January 10, 2004, the Walton Boathouse has become an important fixture for the rowing teams, which have brought home many awards since its construction. The boathouse is located on Episcopal’s Knight Campus. The new tennis center located on the Knight Sports Campus was completed in 2016 as part of the Lead the Way Capital Campaign. It features 10 lighted tennis courts, including a stadium court, built to USTA specifications. The Knight Sports Complex is located at 6757 Atlantic Boulevard, Jacksonville, Florida 32211. Schmidt Field and Crandall-Giles Field, both named in 2017 as part of the Lead the Way Capital Campaign, are located on the Knight Sports Campus and allow more space for ESJ’s growing lacrosse and soccer programs. Built in 1987, the Semmes Athletic Center features three full-sized basketball courts, a separate training room, the varsity men and women’s locker rooms and several offices for Episcopal’s coaches, faculty and staff. The facility is home to the physical education classes, junior varsity and varsity basketball teams and the Middle School, junior varsity and varsity volleyball teams. The Semmes Athletic Center seats approximately 800 fans and is used for pep rallies, athletic award programs, all school assemblies, practices and conference contests, as well as summer camp activities. The Ray Knight Field is home to the Middle School, junior varsity and varsity baseball teams for practices and games. Episcopal frequently allows traveling college teams to use this field for practices when needed. Furnished with ample seating and full-concessions, the Ray Knight Field is the perfect facility for an Episcopal baseball game. The John W. Donahoo Jr. Baseball Training Facility provides extra practice space for batting, throwing and pitching for junior varsity and varsity baseball and softball teams, especially during inclement weather. Home to the softball team, Marchman Field is edged by the St. John’s River and is considered to be one of Episcopal’s most beautiful campus features. Known as Episcopal’s original gymnasium, the Alumni Gym was once used as Episcopal’s chapel and the cafeteria. Today, the Alumni Gymnasium holds multiple classrooms, several offices, a publishing room and two locker rooms. The Middle School volleyball and basketball teams primarily use this facility for practices and games. The River Field includes two practice fields which are frequently used by the football, soccer and lacrosse teams. The fields overlook the St. Johns River. Opened in 1970, the Buck Student Center originally provided meeting space for chapel services and other school events. Today the Buck houses the dining facilities and Campus Store, and provides meeting space for student activities as well as special events such as the Senior Athletic Banquet in the spring. The Episcopal Campus Store is located in the Buck Center on the Munnerlyn Campus. The store offers textbooks, iPad ordering, spirit wear for children, students and adults, some uniform items and school supplies.